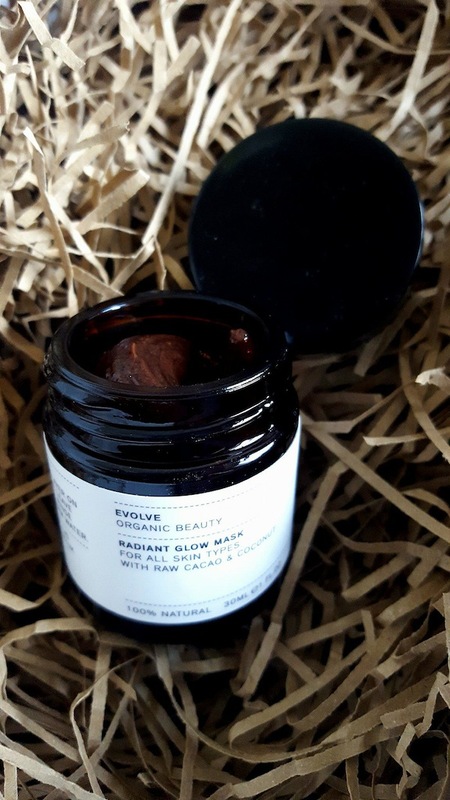 I’m a bit of a chocoholic, so when I saw that the Radiance Glow Organic Mask contained raw cacao powder (rejuvenating and repairing), I was intrigued as to what it would smell like, and yes, it’s pretty much heavenly, as it smells like liquid hot chocolate. It also contains coconut shell powder that gently exfoliates the skin, and the combination of the two ingredients with sweet almond oil (nourishes and moisturizes) makes this one of the best face masks on the market that’s universal in that it’s suitable for all skin types and ages. When I used to work behind the beauty counters, many customers were reluctant to invest in facemasks and I would hear them say they didn’t have time, or if it their budget was tight, it was a choice of a lipstick or a mask they would go for the lipstick as they could see instant results. Trust me, after the first use you will feel and see a difference. One thing I do like about Evolve Organic Beauty is that they offer smaller sizes for most items so that makes it more affordable for those who are apprehensive about investing in facemasks. A 30 ml jar costs £11 and lasts about a couple of months if you use it once a week, or is available as a 60 ml jar that costs £20. When you try this mask, it’s simply a wonderful experience as it smells divine and is easy to apply. Even though it contains coconut granules that help to exfoliate, I would still exfoliate as normal (as you should do with all masks) before applying the mask. Simply leave for at least 5 minutes, and then massage the mask gently into the skin and rinse off. Always apply with dry hands as when water comes into contact with the product (natural sugar extracts) it turns into a milky liquid, so don’t get any into the jar, or use a spatula. The mask is chocolate brown; I don’t advise using a brand new white muslin cloth or flannel to rinse the mask off, while it doesn’t stain, it may leave a small trace that ordinary rinsing won’t remove. The exfoliating granules require a few rinses to remove completely. I would advise using a facial sponge to rinse off the mask as they are easier to wash regularly and won’t stain, plus they are better at gripping residual coconut granules. I have pretty good normal to combination skin, and use masks usually two to three times a week, and I alternate them so I can tell when a mask works. After I used the mask my skin felt even softer, and smoother plus there really was a small glow! The mask is suitable for all skin types and all ages, and I recommend using this once a week or every other week to maintain a balanced and healthy skin, and twice a week for those who have dry or dull skin that needs more stimulation. The bonus is the mask smells wonderful, especially if you love chocolate as I do. If you’re new to using face masks or just don’t know what to buy, you can’t go wrong with this beauty gem. It’s also 100% natural and 86.21% organic! You can buy the Evolve Organic Beauty Radiant Glow Mask from their website, and with each order you get a free sample pack of three other items to try. Birchbox May 2016 Review: Maybe They Do Listen to Feedback?